My brother Ira was a Popeye fan. Me? Looney Tunes all the way. I lost hours of my youth watching Bugs, Daffy, Elmer, Porky, Tweety, the Road Runner, Sylvester and Marvin over and over again the way my son once watched The Bear in the Big House. But, please! Don’t tell him I told you that. Anyway, I’m telling you this as a way of introducing my guest, Andrew Farago. 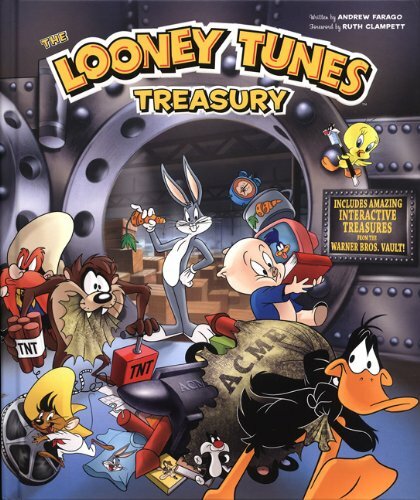 He’s the author of a clever new coffee table book, The Looney Tunes Treasury. In it, each illustration-packed chapter is written by Andrew in the voice of a different Looney character, from Bugs and Daffy to Marvin and Tweety. As if that wasn’t enough, the Treasury is packed with unique collectibles, such as The ACME Catalog – that’s where super-genius Wile E. Coyote gets great deals on anvils – and Daffy Duck stickers. I met Andrew five years ago at his day job; he’s the curator of the fabulous Cartoon Art Museum in San Francisco. I was there as a guest speaker that day and had the opportunity to tour the museum’s amazing exhibits and awesome gift shop. Next time you’re in that bay area, don’t miss it!